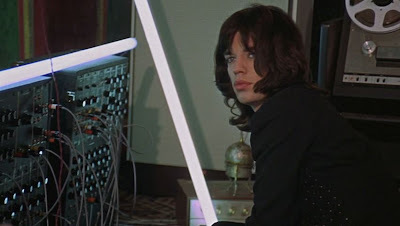 Donald Cammell and Nic Roeg’s Performance (filmed 1968; released 1970), starring Mick Jagger, James Fox, and Anita Pallenberg, is the first—and so far as I know, only—feature film in which a Moog synthesizer makes an appearance. A synthesizer named TONTO appeared in Brian De Palma’s Phantom of the Paradise (1974) but its sounds were not actually heard in the film. If records available at moogarchives.com are correct (and there's no reason to believe they are not), then the Rolling Stones did not purchase a Moog synthesizer until 3 September 1968, in other words, about five weeks prior to the end of the filming of Performance, and after the recording of Beggar’s Banquet (and therefore not, as one might have expected, immediately after the recording of 1967’s psychedelic Their Satanic Majesty Requests). And if Trevor Pinch and Frank Trocco, in their marvelous book Analog Days: The Invention and Impact of the Moog Synthesizer (Harvard University Press, 2002) are correct, then Jon Weiss, "the Man from Moog,” did not arrive in London with the Rolling Stones’ Moog synthesizer until late summer 1968, which jibes with the above date of 3 September 1968. Apparently at the time the idea was that Mick was going to use the Moog synthesizer “as his instrument in the band” (303). At some point, soon after Jon Weiss’s arrival in London, Weiss and Jagger came up with the idea of using the synthesizer as a prop in Performance: “The Moog with its rows of knobs and dials would make a perfect addition” (303). 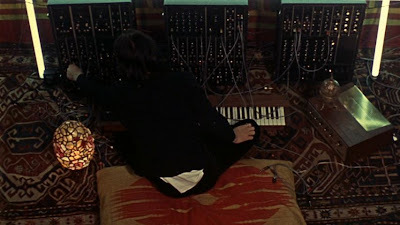 Since, as Pinch and Trocco so astutely observe, the synthesizer was “part of the sixties apparatus for transgression, transcendence, and transformation” (305), the Moog was indeed an ideal prop for Performance, especially since its appearance coincides with Chas’s (James Fox’s) tripping on hallucinogenic mushrooms. We first see the Moog synthesizer—which would have been an utterly unfamiliar piece of technology to the vast majority of viewers at the time—as it sits on the floor of Turner’s studio, a bewildering array of knobs and patch cables framed by fluorescent light bulbs. Turner sits on the floor before it. According to Pinch and Trocco, the Moog used in Performance is a Moog Series III modular synthesizer. The above frame grab from the film conveniently shows the three modules characteristic of a "modular synthesizer." Each one of the modules is essentially self-contained; there were virtually no connections within each of the three modules. The purpose of the patch cords, each with a 1/4" phone plug at the end, was to link the modules together; nothing would happen otherwise. The purpose of the patch cords was to carry one of three types of information: signals, or what sound we ultimately would hear; control, a specific (low) voltage telling the modules what to do; and triggers, or electrical pulses, telling the modules what to do at the particular moment. A closer view shows that a rather simple patch, or connection made between the various modules, has been made. My guess, though, is that while there is the sinister drone characteristic of the Moog on the soundtrack when Chas enters Turner’s studio, that sound was not “live” on the set, but dubbed in later. (The Moog on the soundtrack was played by Bernie Krause, one half of the synthesizer team known as Beaver and Krause.) My guess is that while Mick is shown twiddling some knobs and feigning some adjustments, the synthesizer isn’t actually turned on at all. What Mick seems to be doing with his left hand is fiddling with the knobs of a controller section, which appears to be a Moog 901A VCO (the "voltage control oscillator," the thin panel at the extreme left) combined with a series of Moog 901B oscillator controllers (each of the panels lined up next to it to the right). His left hand seems to be turning the lower knob of a 901B unit. Directly above his left hand is the 904 series of “filter modules,” the 904A “low pass filter" and the 904B “high pass filter," the electrical systems that in fact defined the Moog and for which Robert Moog had filed patents. The second module from the left, sitting between the 904A (far left) and 904B (right) is the 904C coupler that mixed the output of the two filter modules (it could also be turned off and hence not used). Mick’s head is partially covering the Moog 901 voltage controlled oscillator (VCO), while the larger unit of knobs in the left center of the module on the far right is the Moog 960 sequential controller, which could provide a series of controlled voltages. Only one of the eight stages was active at a time, indicated by the row of lights across the top (none of which are lit, nor does the sequencer appear to be used as a part of the patch). 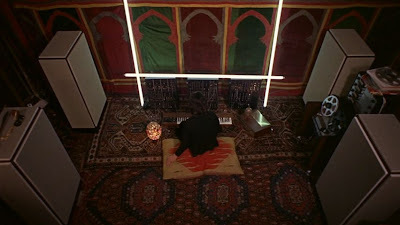 1) According to Pinch and Trocco (348) the patch that the man from Moog, Jon Weiss, had set up for Mick on the synthesizer used in Performance was used to create the soundtrack for Kenneth Anger’s short film Invocation of My Demon Brother (1969), which featured a soundtrack by Mick Jagger. 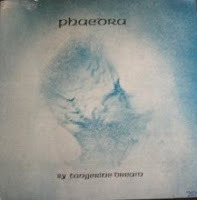 If the Performance modular synth was indeed sold to Christoph Franke of Tangerine Dream in 1973, then the first album made by that group on which that particular Moog appeared was Phaedra, recorded late in 1973 and released early in 1974, an album that is now considered an essential album of electronic music, and a breakthrough in the use of synthesizer/sequencer technology.